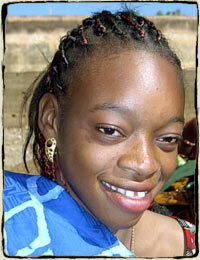 Awa, approximately age 13, lives with her father and mother and is eldest of 4 children. Her parents divorced and her mother remarried and had an additional 5 children for a total of 8 brothers and sisters. Awa is slightly deaf and has difficulty speaking. After a bout with malaria when a doctor injected her in the leg with Kinimax, Awa had a reaction and became lame. She has difficulty walking without a brace. While her mother tried to send her to school, after 3 years, the school sent her home, saying it was too difficult because of her disabilities to be in class with others. Since then, Awa has stayed at home doing housework and braiding hair to generate income. She and her mother say the Hèrè jè Center is a "gift from God" because it is helping Awa become independent, generate income and has built her self-esteem. Awa is a master at beading and designing jewelry. She is also skilled at sewing but wants to focus on jewelry-making. She, along with Atou will manage the marketing and display center at Hèrè jè Center.